As our living space is shrinking in face of the increasingly aggressive urbanization, optimizing space is not just a part of the trendy minimalism but a matter of the era. One of the most significant living spaces, kitchens these days are too changing in the same direction, more or less. In the US, where an average-sized kitchen is 175-200 square feet, small kitchens of around 100 square feet are gaining popularity. Meanwhile, in Vietnam, you can easily find a kitchen that takes up less than 3 meters in length to fit small apartments. Sizes aside, these kitchens are mostly designed with galley, L-shaped and single-wall layouts so they can work perfectly for open floor plans, and thus helping you optimizing the whole space of your house. If you are looking for a kitchen that is small in size, but big in design and functionality, the following kitchens may help. Despite the length of 2-2.5 meters, this kitchen of Häfele is fully equipped with appliances essential for a modern kitchen, including a hob, an oven, and a cooker hood. Thanks to the galley layout, the kitchen optimizes the wall corner and at the same time, creates enough space for your easy movements during cooking. One of the counters can even be used as a breakfast bar when needed. 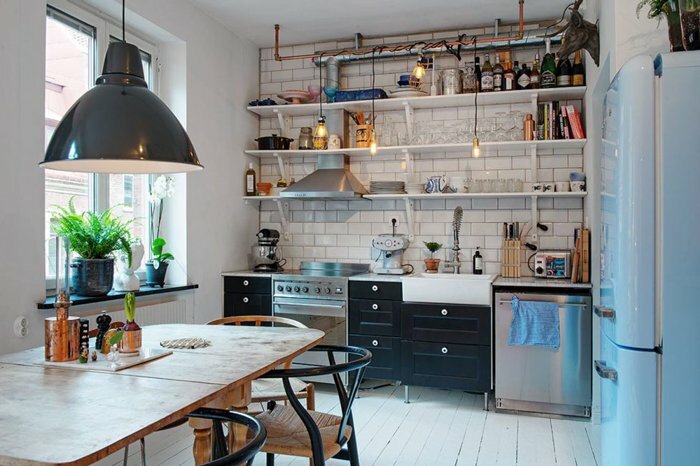 Part of a 41-square-meter apartment in Sweden, this down-to-earth kitchen exemplifies the Scandinavian-styled minimalism through details like the small footprint cabinets, and the ancient-looking light bulbs. Open shelves as well as the big window and houseplants on the sill effectively keep the small kitchen from feeling overcrowded but airy, instead. 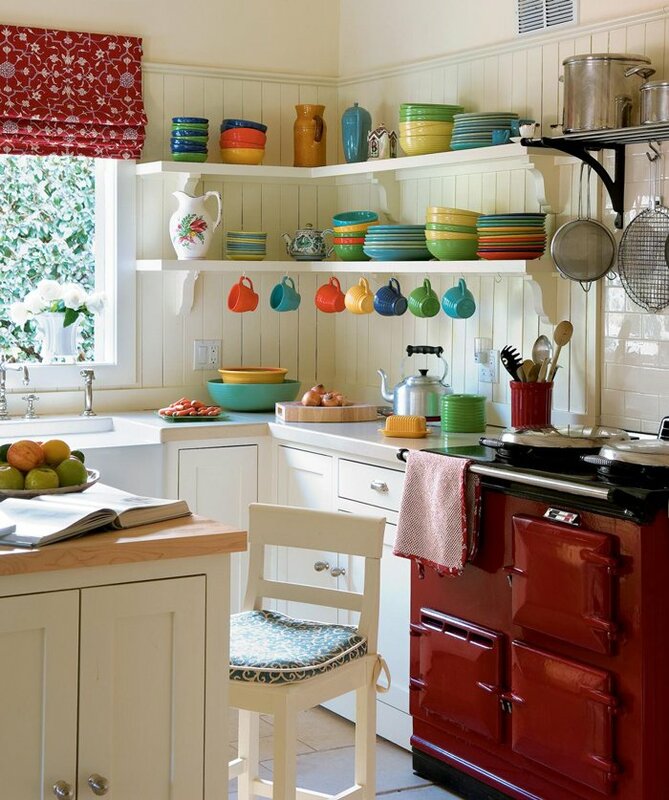 This kitchen may be limited in space, but its owner obviously knows how to cross the boundaries to create such a bold style with impressive touches, from colorful tableware to a berry range cooker and a flower red window curtain. Once again, open shelves have proved their effectiveness in visually expanding the space of small kitchens. 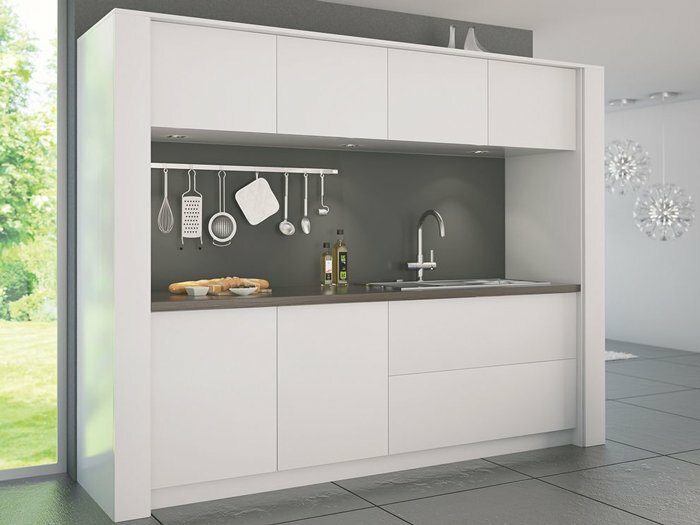 Last but not least, this compact kitchen from Häfele can fit anywhere in your home thanks to its single-wall layout and the flexible white color. 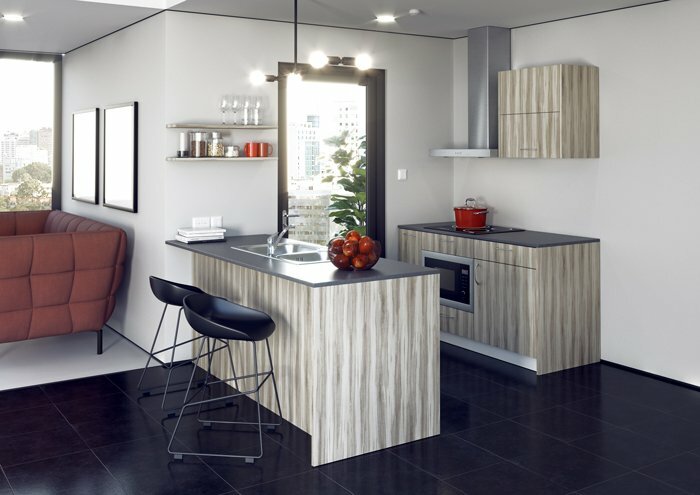 Moreover, with innovative furniture fittings, the cabinets make it easy for operation – handless doors opened smoothly due to soft-close hinges – as well as storage.